These kinda scream spring... And they feel really good on the wrist. Nothing too bulky and nothing to irritate the wrist while moving about. A bunch oh' stitching for sure... but oh so worth it. This pattern started out with inspiration from Fusion Beads sedona sunset design and then I went off track... which is what I usually do. The center three triangular designs follow Fusion's pattern, but the rest just kind of came from the seed beads on my mat and out of my needle! Ha. Really happy with both color combinations and the slight changes to make them unique and my own! Some fun new earrings as we transition into spring. My color choices start to creep -- ever so slowly -- towards brighter shades. Still some fall/winter tones, but movement towards the new season. 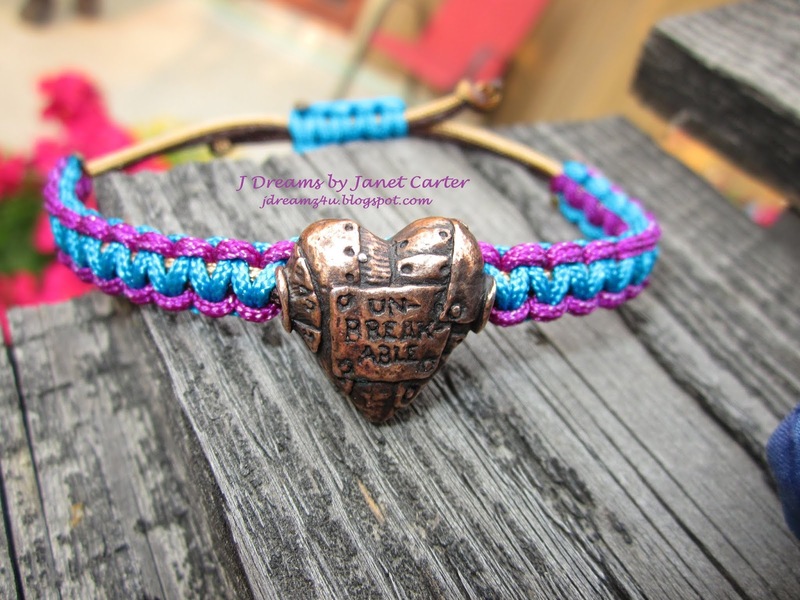 Design below from Fusion Beads' Inspiration page. They look just like their "Peacock" name. A 12 mm swarovski crystal provides an incredible center point for the turquoise, blue and purple seed beads that surround it. F U N to make and wear! Next design is patterned after a "Bubbly" wire earring pattern from the July 2013 Bead Style magazine. A design by Madelin Adriani Pratama. I didn't want the bubbly as much as a cleaner line with some dangles and a feather, so here's my version. The older beading magazines are so wonderful to thumb through when my brain is less than inspired. So many options and such limited time!!! Such a darlin' pair -- a beaded bead of fire polish with a czech glass flower dangle, and a metal Native American coin as the earring post. The flower star beads below are incredible - like a lapis finish - and very unusual. I can't even remember where I picked these up, but I have been using them sparingly as I don't have many. The brilliant blue pearls really make them pop! And, some fun hammered hearts - with fire polish and seed beads wire wrapped. Projects that began with a beautiful bird by Heather at Humblebeads. Add a tiny perch, some dangles, some ribbon and badda bing, badda bang!! :) These birds are so much fun -- I confess I have several I've been hoarding. But, alas, these two flew the coup. Hope they are happy in their new homes!!! I didn't get a great picture of this next set, so I feel bad about that. Sometimes there isn't enough time, or the light will not cooperate in the time I do have. But, this was also a wonderful combination. Pattern credits for the earrings were in my "Remembering Christmas" post. 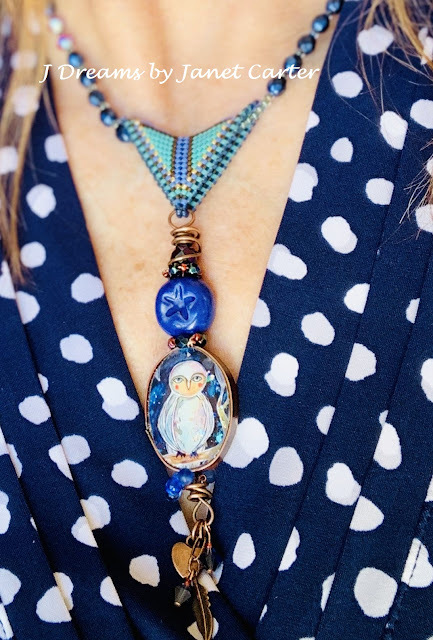 Each of my creations truly does begin with a tiny flicker of a vision, and many come from pieces or parts I have purchased from other creators. If you follow this blog, I'm repeating myself here, but I have my favorite artists - those who never disappoint. Their work provides me with so much positive energy, and joy through the process. The necklace below started with an incredible pendant from Staci Louise originals, which I then wire wrapped so I could layer on one of her incredible bronze pieces. I also painted a metal leaf to dangle off the bottom, with a Czech glass flower, rondelle and round. This piece feels like it has a lot to say... if I listen carefully. LaShell Wyskochil sari silk for a soft drape of a necklace. I also wire wrapped around the ribbon just above the pendant to keep it close to the focus. I really liked the dimension it added without being too much. And, below, some earrings I put together to go with. The beads all jumped out at me as I was piecing together the design. The light purple color of each is hard to see in this photo, but you get the idea -- they are truly yummy! Czech glass and some swarovski crystals with some enameled C-Koop heart locks I'd been saving for just the right project. Ahhhhhh, really beautiful together with the copper. And then... one more raku pendant shot below with the gorgeous earrings, making it a set. These are a design by Michelle McEn, from a 2015 Beadwork magazine. Good thing I keep ALL these magazines chalk full of inspiration. I was thumbing back through my stack... and came upon this pattern using pellet beads. So many fun shapes of beads anymore... I can't keep up, but always love trying new beads and designs. As we neared Christmas, YEP, that holiday that's just a distant memory now... I found a really fun earring pattern that I could easily color adjust to make each one an original. The pattern is so versatile, and the earrings turned out really light and just pretty gorgeous. I also made some brick stitch trees inbetween because I'm not great at making the same pattern too many times, so a diversion and distraction was in order. The last pair shown was made for my mother, who's birthday is December 23 and needed to not be Christmas colors! Plus, she wears clip on (components f/Fusion Beads), so this pattern lent itself well to that change. The pattern on the repeat earrings was aptly called "poinsettia" and can be found on the FusionBeads.com website. They have many fun patterns posted in their inspiration section, and these were exactly that! 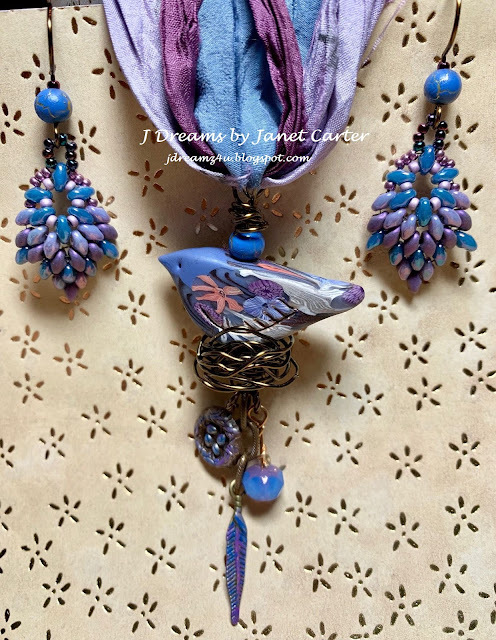 Last fall, I had continued on the raku trail because I love the rugged pendants with copper wire, coupled with the softness of the sari silk fibers from LaShell Wyskochil. These pieces were made for special people. I find the wire wrapping to be so relaxing... that is, once I get over my fear of it. Each one takes on a life of its own, which spurs me on to try another, and another, and another! and of course, all good raku pendants need something to go with, like a bracelet or earrings. Here are a few of what worked as compliments. The colors were so delish! Copper heart is from Green Girl Studios, and the design for the earrings is from Svetlana Chernitsky published in a 2015 special edition of Beadwork magazine.